My children were obsessed with miniature language objects as toddlers and preschoolers. Like them and many other children, my 3½-year-old granddaughter, Zoey, has the same obsession. I’ve always wanted an attractive and inviting way to keep language objects organized. 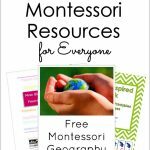 I’m excited today to let you know about our new Montessori-inspired printables that will help you organize language objects in an attractive and inviting way. 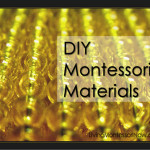 This is a new product in our Living Montessori Now shop! 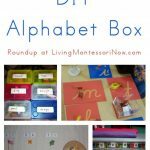 You’ll get printable labels for your alphabet box with lowercase letters in manuscript, D’Nealian, and cursive. Choose whichever you’d prefer. 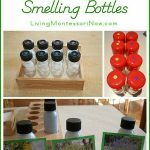 Any of those would be great for Montessori homes or classrooms. 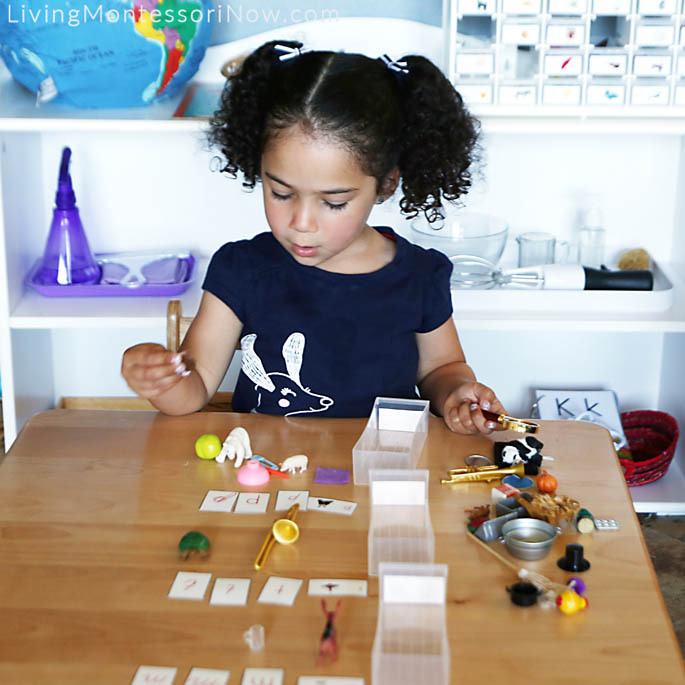 In Montessori education, we typically only introduce phonetic sounds rather than letter names and lowercase letters rather than uppercase letters. Children tend to spontaneously pick up both the letter names and uppercase letters. If you prefer both uppercase and lowercase letters, there are labels for each picture with a capital letter and lowercase letter in manuscript, D’Nealian, or cursive. I realize that many preschool teachers prefer to have both together. Because there are 30 drawers in many craft supply cabinets, we have labels for the phonograms ch, ph, sh, and th. I find that these often need to be introduced to children who are learning beginning sounds when they get confused by words like “shark.” I have a helpful post on how to introduce words that start with phonograms to young children. Of course, feel free to use these four drawers for something else. A variety of small language objects. I used ones from Montessori Services (available as a starter set or individually), Safari Ltd. TOOB figures, and Safari Ltd. Good Luck Minis. And some were just around my house. 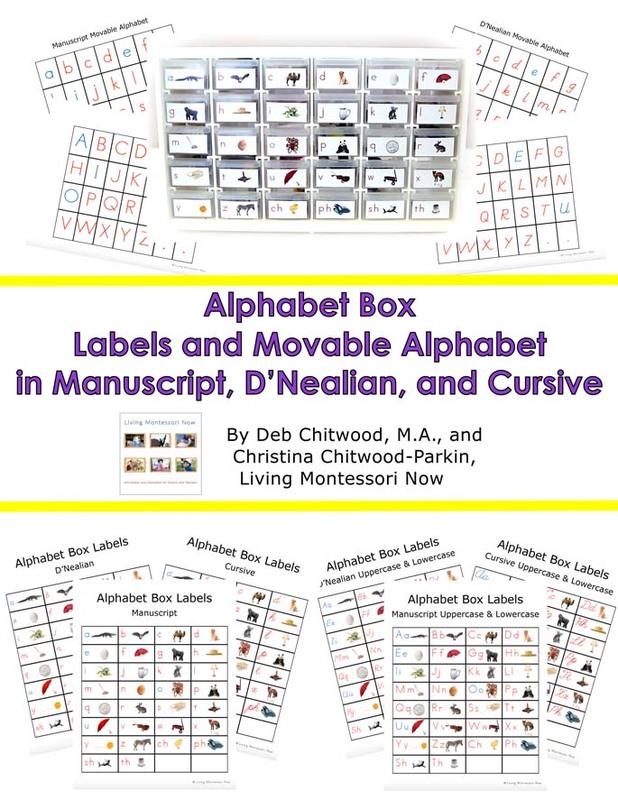 After downloading the Alphabet Box Labels and Movable Alphabet in Manuscript, D’Nealian, and Cursive, just print the labels in your desired font on cardstock or photo paper, laminate if desired, cut out, and tape each label to a drawer. 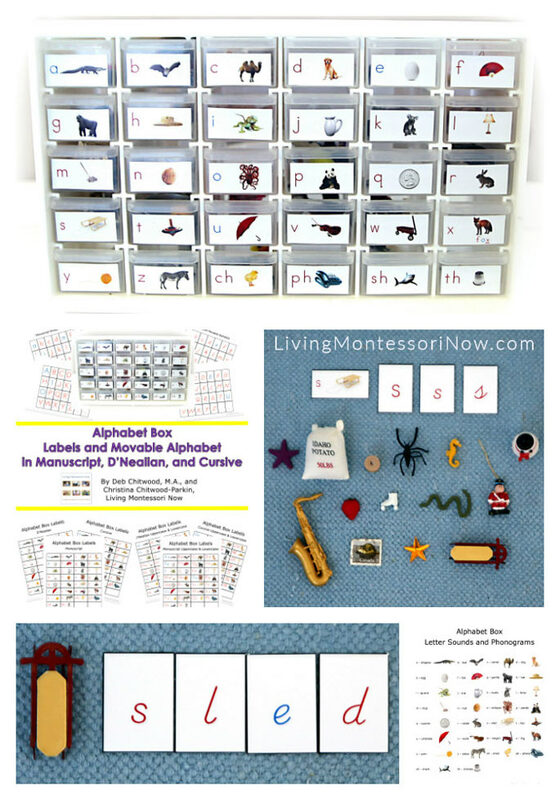 We have a page of the letter sounds and phonograms with pictures at the beginning of the pack. You can use that for vocabulary and to help even toddlers hear beginning sounds. They don’t need to learn to identify letter sounds yet, but it’s helpful if they start to hear what sounds words begin with. Here’s an example of the cards and objects in my letter “s” drawer. Yes, they all fit easily in the drawer! 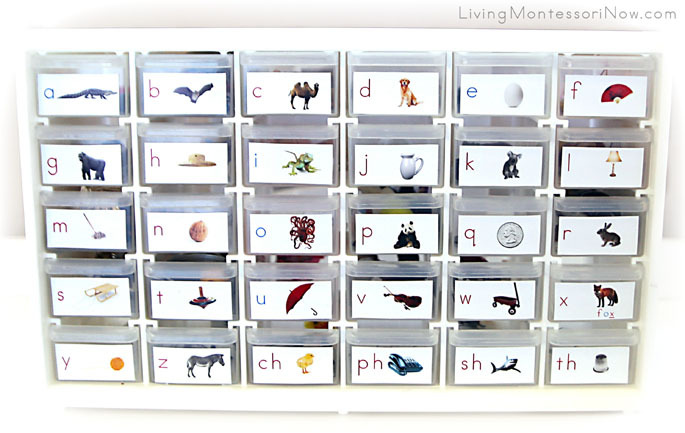 A child could get out two or more drawers and then sort the letter cards and objects into the correct drawers. You can work on beginning sounds with 1, 2, or 3 drawers at a time. Here’s Zoey sorting the objects and letters (extra copy of the drawer labels plus a movable alphabet letter in manuscript, D’Nealian, and cursive) from the m, t, and p drawers. We just emptied the drawers onto the table, and then she sorted them out again. Zoey also loves just looking through the drawers. 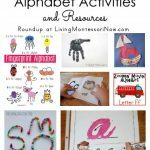 A child who’s ready to build words can use some of the objects and the printable movable alphabet in whichever font you prefer to build words. An older child could even build sentences. Capital letters and punctuation symbols included for sentence building. 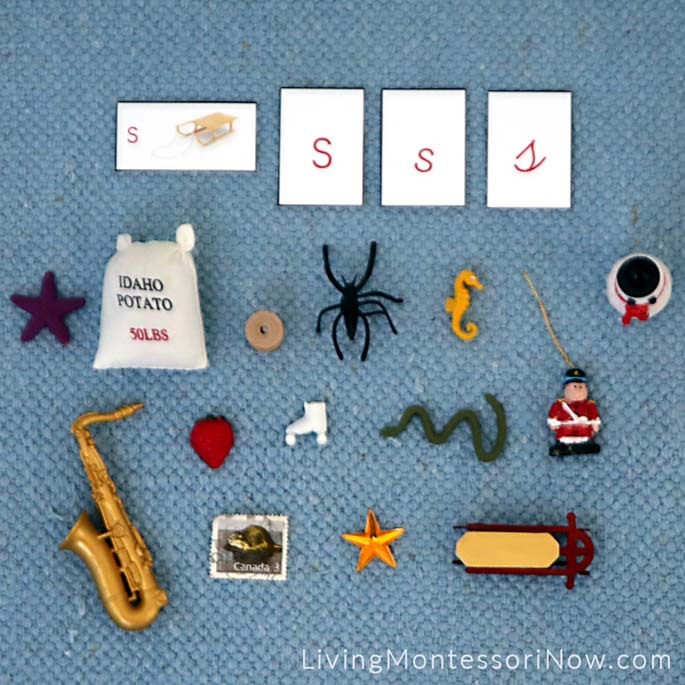 If you’d like help with introducing phonetic sounds, introducing object with sounds, or beginning phonics in general, check out my DIY Beginning Montessori Phonics with Preschoolers.